Erwin Muilwijk has undertaken to explore a subject usually given a cursory look at in the history of the Campaign of 1815: the contribution of the Kingdom of the Netherlands to this campaign and the defeat of Emperor Napoleon I. 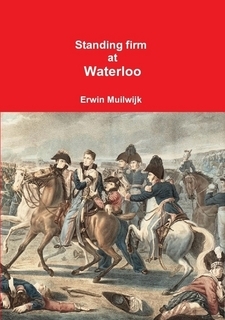 This is the third volume in a four volume set entitled The Netherlands Army During The Waterloo Campaign. Volume 3 “deals with the specific role of the Netherlands field army on both days of 17th and 18th June” culminating in the Battle of Waterloo. The volume is a large paperback divided into an “Author’s Preface,” fourteen chapters, “Annex” (detailing the Netherlands army’s Orders of Battle), “Bibliography,” a list of 68 photographs, illustrations and portraits, a list of 7 maps and an index. The author also includes ten sidebars with interesting information on items outside of the text such as, Escorting the prisoners of war and The Lion Mound. A nice touch! The photographs, illustrations, portraits and maps are mainly in wonderful full colour. They are a delight to look at and add greatly to the enjoyment of the volume. The author has chosen them well. The modern photographs, by the author, are a bonus. All of which significantly enhance the iconography of the battle. They are new to this reviewer. The maps compliment the text. This third volume continues to present fresh perspectives on 1815. It is both enlightening and entertaining. It is well written and is expertly end-noted in each chapter. As befits a military history, the author has provided a straight forward account of the actions of the Netherlands army including the details on Prince Frederik of Orange’s Corps at Halle, Bijlandt’s brigade, the Netherlands cavalry and Chasse’s Division. Areas usually remarked upon in other histories. The volume has more than enough thorough detail and information to satisfy any historian from the academic to the newly interested. Definitely this new volume deserves to be in the collection of anyone who enjoys studying or just reading about the campaign of 1815. Most highly recommended.